The HyperX Cloud Revolver is a gaming headset launched by Kingston on March 29, 2016. HyperX was already one of the most recognizable brands in the PC market due to its production of quality memory products, mainly for gaming purposes. Recently, it began producing gaming headsets and it is not surprising that its Cloud series of gaming headsets turned out to be an immediate success. These headsets provided excellent sound quality and other spectacular features. 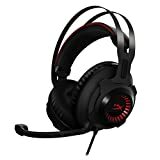 The HyperX Cloud Revolver is the first headset of the second generation of HyperX gaming headsets and is among the most prestigious headsets. From various sources, it has gained an average rating of 4.0 out of 5 and was introduced in the market for $120. The HyperX Cloud Revolver carries the signature colors of Kingston, red and black. The bridge of the headset has two parts. At the top, there is a sleek metal surface bridging the two sides and beneath it is a soft and cozy headband which allows the headset to rest on the head of the user while the hard metal surface is suspended in the air, all the while providing it durability. The inside of the ear cups has the signature memory foam of HyperX, which contributes to the comfort of the headsets and is a luxury to the ears for long hours of gaming. Its light weight of about 360 grams exerts low pressure on the ears so that the user does not have to worry about earaches. The outside of the ear cups has a bit of a fancy touch to it as it is shaped like jet engines. However, the ear cups are completely closed, canceling the background noise. Moreover, it has a 1m long braided cable that can withstand jerks and pulls, increasing the durability of the gadget. The HyperX Cloud Revolver is a high-level gaming headset which provides studio-grade sound, allowing the gamers to hear the slightest sound and pinpoint the location of their enemies. For music lovers, the gadget provides a concert-hall like an experience of listening to music with diminished background noise. It also has a detachable noise-cancellation microphone, which can be easily removed and replaced from or in the headset and it responds to a frequency range of 50 Hz – 28 KHz. Next-generation 50mm directional drivers are installed in the speakers as well, which dictate the sound directly inside the ears, providing a high-quality experience to the user. The Cloud Revolver performs eminently well and delivers a mesmerizing experience to the gamers. Its studio-grade sound gives it an edge over its competitors. Its microphone works exceptionally well and is efficiently able to cancel background noise. Its design allows it to picks up the sound of only the person wearing the headset, resulting in clearer transmission of sound. The highs and lows of the game can be heard crystal clear. Furthermore, the headset is compatible with different platforms including the Xbox One. However, the Xbox One stereo adapter needs to be purchased separately. Although the headset is astoundingly great, its price is much higher than some of its competitors, however the headset is such a great piece of manufacturing that it can be argued that it warrants such a steep price point.